1. Selcuk Iletisim, is an academic “peer-reviewed” journal covers all scientific studies in communication sciences based on research, idea, practice, etc. All submitted papers to the journal, are taken under preliminary consideration by an editorial board and then they are published after at least two favorable reports of reviewers. 2. Selcuk Iletisim is published biannually in July and January. 3. Papers should be original that have not been published in any publication or have not been in the publication process. The fact that the paper has been presented at a congress, symposium or in a meeting is not a violence for this rule. Generated papers from master’s and doctoral thesis are not given place to the journal. 4. Papers should be written on one side of the A4 size paper, the title of the paper should be 12pt, the abstract and the main text should be 11pt with the Palatino Linotype font. 5. Page margins should be 3,5 cm. 6. The authors should be signed up and then logged in to the system at http://dergipark.gov.tr/josc. They have to submit their papers through the system on this page. 7. Title and institution of the author should be shown in a footnote. 8. All papers should be composed of 3500 to 10000 words. 9. All approved papers to publish are offered on the website in a pdf form. 10. Within the specified principles, the responsibility of papers (initialness in publishing, source accuracy, claimed views, etc.) belongs to the authors. 11. 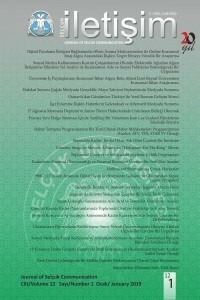 The copyright of published papers pertains to Selcuk Iletsim Journal. 12. There should be a Turkish and English abstract, which does not exceed 200 words and should contain key words under the abstract. Please note that: In order for the studies to be evaluated, the Turnitin plagiarism report should be less than 20%. Studies with similarity rates above this ratio will not be taken into consideration. Original data of studies using survey can be requested. 4. All references in main text should be shown in references and all references should be ordered alphabetically based on surnames of authors. 5. If more than one studies of the author is to be included in the bibliography, a ranking should be made according to the date of publication. For papers published in the same year, “a, b, c…” should be used. 4. 4. All references in main text should be shown in references and all references should be ordered alphabetically based on surnames of authors. 5. 5. If more than one studies of the author is to be included in the bibliography, a ranking should be made according to the date of publication. For papers published in the same year, “a, b, c…” should be used. Bostancı M N (1995) Toplum Kültür ve Siyaset, Vadi Yayını, Ankara. Fiske J (1996) İletişim Çalışmalarına Giriş, Süleyman İrvan (Trans. ), Ark Yayını, Ankara. Burgoon M and Bettinghaus E P (1980) Persuasive Message Strategies, M E Roloff and G R Miller (eds), Persuasion: New Directions in Theory and Research, Sage Publications, California, 141-169. Aykaç B (1990) Propaganda ve Halkla İlişkiler, Kooperatifçilik Derg, 90, 27-50. Kalender A (1998) Seçmen Tercihini Etkileyen Propaganda ve İletişim Faktörleri: Türk Seçmen Davranışı üzerine Bir Araştırma (Konya Örneği), Doctoral Thesis, Soc. Sci. Inst. of GÜ, Ankara. Tuncel H (1997) Küresel Şirketler, Yerel Medyalar, 5. Uluslararası Sosyal Bilimler Kong, 12-14 Kasım 1997, Ankara. Anderson S P (2005) Regulation of Television Advertising, www.virginia.edu/ economics /papers/anderson/tvadreg081705.pdf, Date Accessed: 27.06. 2006.